 Log In needed $849,000 · Shawnigan Rancher & Dream Shop! 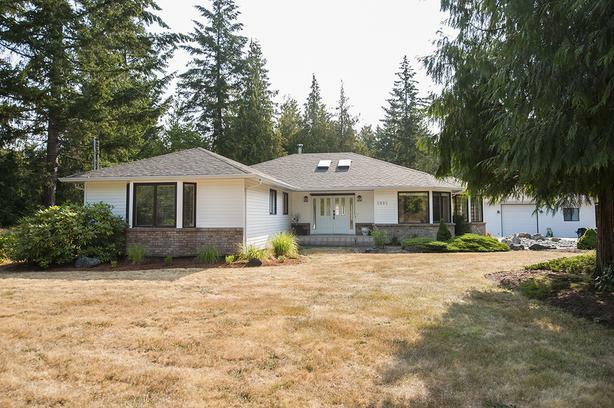 Beautiful, level 2 acres with 2,350 sqft custom rancher and a dream shop! Located in a quiet area minutes from the lake, sits this one owner home in excellent condition. Large entrance with hardwood floors, sunken living room, and tiled formal dining area. Lovely maple kitchen with spacious nook. There is a huge family room with woodstove, wet bar, and access to the 500 sqft rear deck. Central 4pc bath and three bedrooms including the spacious master with walk in closet and lovely ensuite. Other features include wood windows, high crawlspace and a two-year-old roof. The amazing shop has a large central garage and four separate rooms set up as a gym, hobby areas, plus a 2pc bathroom. There is also a large detached shed and covered storage. Amazing level and private acreage with two driveways allowing you to bring in your large trailer, boat, RV, or motorhome without the need to turn around!